Tour a house with 50 varieties of fruit in less than 2,500 square feet of plantable yard. By terracing the hill in her backyard and espaliering her trees, this home orchardist converted her yard into a high-density Victory Garden. This garden is in Southern CA, but the same edible garden would do well in many other parts of the central valley, including Sacramento. Dave Wilson Nursery's Ed Laivo invites you into his backyard and gives you years of blueberry growing advise, in less than seven minutes. This is a great video where Ed Laivo shares his knowledge about growing different varieties of blueberries that bear in early, mid-season and late season. All these healthy plants are being grown in pots. Very informative! Purple carrots have all the tasty benefits of their orange counterparts, and then some. Purple carrots aren't simply a novelty. Their unique color reflects their healthy phytochemical constituents. Not only does 'Purple Haze' have the vitamin A and beta-carotene of ordinary carrots—evident in its orange center—it's also rich in anthocyanins, the antioxidant compounds that give blueberries their distinctive color and superfood health benefits. Studies have found that these blue and purple pigments can improve memory, enhance vision, protect against heart attacks, act as anti-inflammatories, and even help control weight. 'Purple Haze' mirrors the original color of carrots cultivated in Afghanistan 5,000 years ago. It grows well in most zones but prefers soil temperatures of 59°F to 68°F to create its spectacular purple skin. Otherwise grow as for other imperator (tapering) carrots. 'Purple Haze' matures in 65 to 70 days. Pull the roots (wet the ground to make harvest easier) when the shoulders are deep purple. In cold climates, carrots can be left in the ground even through winter, beneath a deep mulch of hay or straw. In warm climates, however, carrots left in the ground are vulnerable to insect pests, so it is best to make successional sowings and harvest carrots as they mature. Store them in the refrigerator, in a plastic bag, with the foliage trimmed off. Don't store them near apples or pears, which give off gases that turn carrots bitter. 'Purple Haze' carrots are sweet and delicious raw or cooked, but they lose much of their gorgeous color when boiled. For that reason, serve them fresh from the garden whenever possible. Slice 'Purple Haze' into medallions, mix with other colorful carrots, and serve with dill dip, or grate and toss with white cabbage and orange carrots for a colorful coleslaw. Coat whole or sliced carrots with a little olive oil, sprinkle with fresh or dried thyme, and roast until soft, which enhances their inherent sweetness. For a sweet side dish, saute carrots lightly in olive oil and serve them with a maple glaze; for a savory twist, add yellow or purple onions that have been sauteed until soft. 'Purple Dragon'. 65 to 70 days. 6 inches. 'Atomic Red'. 76 days. Rich in the anti-oxidant lycopene. 9 inches. 'Solar Yellow'. 63 days. Totally yellow, crunchy and sweet; high levels of lutein, which can improve eye health. 7 inches. 'Lunar White'. 60 days. Almost entirely coreless; has a mild flavor, especially when picked small. Crunchy. 8 inches. (NaturalNews) Purveyors of conventional and genetically-modified (GM) crops -- and the pesticides and herbicides that accompany them -- are finally getting a taste of their own legal medicine. Minnesota's Star Tribune has reported that the Minnesota Court of Appeals recently ruled that a large organic farm surrounded by chemical-laden conventional farms can seek damages for lost crops, as well as lost profits, caused by the illegal trespassing of pesticides and herbicides on its property. PFU settled with the Johnson's out of court, and the Johnson's agreed to sell their tainted products as non-organics for a lower price, and pull the fields from production for three years in order to bring them back up to organic standards. But PFU's inconsiderate spraying habits continued, with numerous additional incidents occurring in 2005, 2007, and 2008, according to the Star Tribune. In a similar case, a California-based organic farm recently won a $1 million lawsuit filed against a conventional farm whose pesticides spread through fog from several miles away, and contaminated its fields. Jacobs Farm / Del Cobo's entire season's herb crop had to be discarded as a result, and the court that presided over the case acknowledged and agreed that the polluters must be held responsible (http://organicfood.einnews.com/arti...). The stunning victories of both the Johnson's and Jacob's Farm / Del Cobo against their chemical-polluting neighbors is huge, in that it represents a new set legal precedent for holding conventional, factory farming operations responsible for the damage their systems cause to other farms. And with this new precedent set, many more organic farmers, for instance, can now begin suing GMO farmers for both chemical and genetic pollution that drifts onto their farms. Many NaturalNews readers will recall the numerous incidents involving lawsuits filed by Monsanto against non-GMO farms whose crops were inadvertently contaminated by GM material. In many of these cases, the defendants ended up becoming bankrupted by Monsanto, even though Monsanto's patented materials were the trespassers at fault. But it appears that the tables are now turning. Instead of Monsanto winning against organic farmers, organic farmers can now achieve victory against Monsanto. In other words, farmers being infringed upon by the drifting of GM material into their fields now have a legal leg to stand on in the pursuit of justice against Monsanto and the other biotechnology giants whose "frankencrops" are responsible for causing widespread contamination of the American food supply. 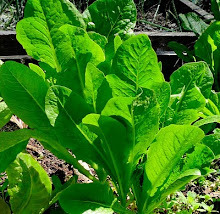 Genetic traits are highly transmissible, whether it be through pollen transfer or seed spread, and organic and non-GMO farmers have every right to seek damages for illegal trespassing when such transmission takes place. It is expected that many more organic farms will step up and begin seeking justice and compensation for damage caused by crop chemicals, GM materials, and other harmful invaders. For too long, Monsanto has been getting away with suing farmers whose crops have become contaminated by Monsanto's patented genetic traits and chemical materials, and winning. Thankfully, the justice system seems to now recognize the severe error in this, and is now beginning to rightfully hold polluters and trespassers responsible. Monsanto, your days are numbered. Due to the hot and humid weather, lately many gardeners are noticing “blossom drop” on their tomato plants. 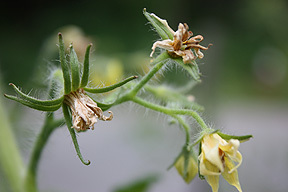 Blossoms are drying up and dropping off before the tomato fruit sets. “This condition is NOT related to any nutritional disorder, or any disease or insect damage. It is related to temperature. Despite the fact that tomatoes evolved in the tropics, flowering in tomato is sensitive to temperature. When day temperatures exceed 85°F and night temperatures exceed 72°F, tomato flowers will abort. An important factor involved with temperature is time of exposure. The longer the plants are exposed to these high temperatures, the longer the condition will last and the more serious the effect on flowering. Short exposures such as a week or less should not cause much of a problem. It is interesting to note that although the combination of high day and night temperature causes blossom drop, high night temperatures alone can be detrimental to flowering even if day temperatures are not over 85°F. High levels of humidity can “gum” up the pollen in the flowers, preventing the pollen from moving from the anther to the stigma, which would normally result in pollination. Some gardeners have suggested shaking the plants to help the pollen move around.